Louise Gaskill is leaving her mark on the world of interior design with her passion for lamping, a process of building creative lighting from an assortment of pieces. It’s the way her sky blue eyes catch the window light in her studio no matter where she is in the room, or how her nonstop smile makes you smile while you listen to her talk about her work. 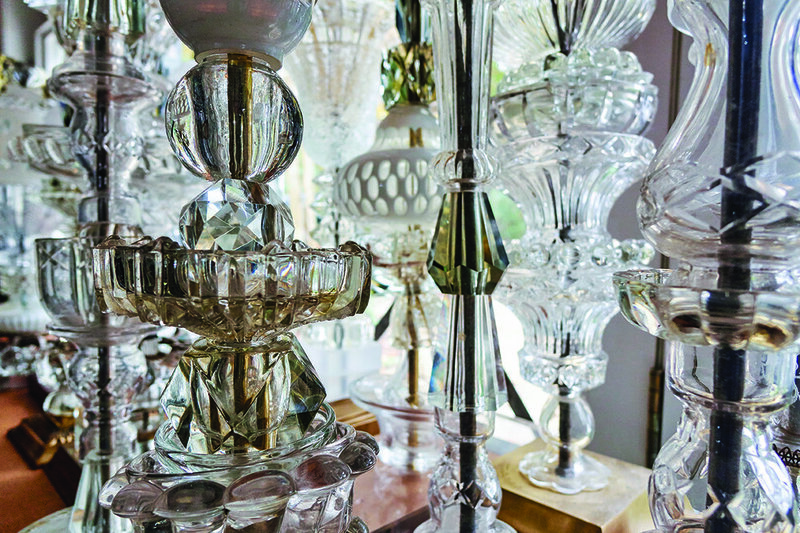 Louise Gaskill, a North Carolina native and current Raleigh resident, is reworking vintage German and Italian glass items and newly gilded metal components into inspired and unique lighting creations. Once you see her lighting, you can’t stop thinking about how it is not only different, but also quite inviting. And like her eyes finding the light in the room, her creative mind is finding new ways to blossom, namely as an abstract painter and creator of gilded drapery finials and hardware. Our two-hour interview and photo session in her busy studio is much more of an ongoing conversation than a question-and-answer session as we explore her expectations, approach, and methods to her creations. “It’s all about making the shapes work together and bringing the pieces together that really aren’t supposed to go together—but they do if you layer them right,” Louise says about her lighting pieces. It’s because of this ability to find the right path for a piece that her reputation is soaring, and demand for her work is steadily growing. 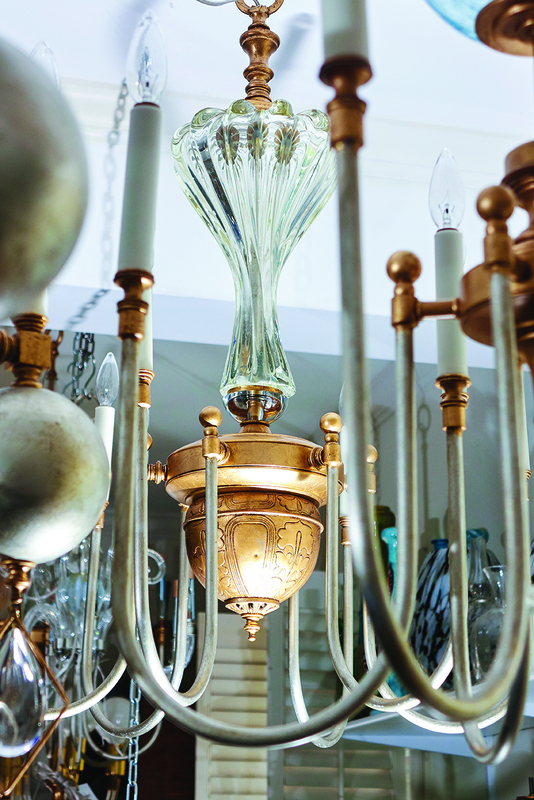 The resulting chandeliers, sconces, lamps, and pendant lights are curious and inviting. After seeing her work for the first time, you begin to re-think what’s possible. I find the open and airy structures of her lighting to be my favorite aspect. For example, her studio ceiling is crowded with chandeliers, and yet you can easily see through the entire space. Unlike many of the trendy industrial lights that are the current rage, her chandeliers do not block your view or demand your attention because of their size. Gaskill and her work are nuanced and thoughtful rather than imposing and exhaustive. She and her work are the refreshing breeze on a hot summer day, and not the heat itself. Speaking about her creative methods and their intentions, Gaskill says she often “sees” the finished piece before starting a lighting project, and she is using her nearly nonexistent spare time to produce an entire line of gilded finials, rods, and hardware for drapery. She paints on the weekends to take a break from the weekday workload of fulfilling lighting orders, and her paintings are dear to her, as they offer both a break from client orders and a chance to express herself without restraint. Gaskill prefers oil paints because they are—as she lovingly puts it—“forgiving,” and can take many days to dry. That protracted drying process has become an integral part of her technique in which she scrapes off the semi-dry paint. “And then I put it back on, scrape it off, put it back on, and then the shapes start to emerge from all the layers of paint, and the shapes behind come to the front,” she explains with a smile. Louise Gaskill and her lighting, paintings, and drapery finials will be moving to a permanent showroom in the Market Square building in High Point starting with the spring designers’ and artists’ market show.